I received this sauce as birthday gift, and from the front label, was not entirely sure of its origins. 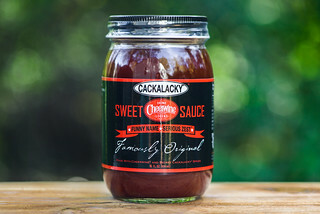 A quick pop of the name into Google brought up this sauce, among six others, as offerings from the high-end retailer Williams-Sonoma. Hiding behind a corporate veil, there's nothing I can come up with about who developed this sauce or how. Since it was a gift, I tried my hardest not to look at the price, but I couldn't help it, and saw the $12.95 price tag. 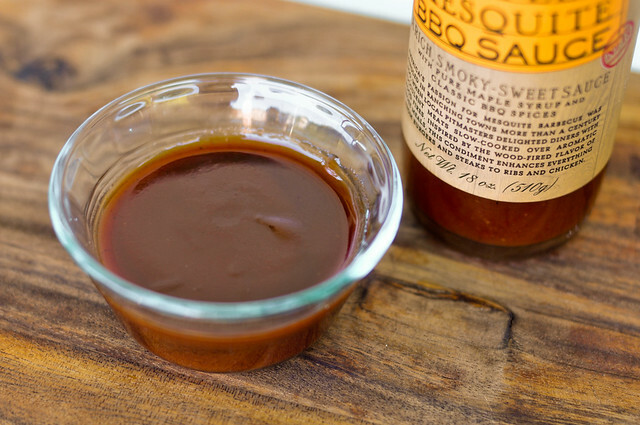 I'm not sure if this is the most expensive barbecue sauce on the market, but it's most definitely the priciest that has ever touched my lips. A big whiff of this is like filling your lungs with billowing mesquite. The strong scent of the heavy mesquite dominates any other aromas that might be hiding in there. The sauce poured freely out of the bottle, with a thickness right smack dad in the middle of the scale between thin and thick. There were visible specks of spices, although the overall texture was incredibly smooth. The taste followed the tale of the aroma—heavily smokey, almost teetering on being too pungent. 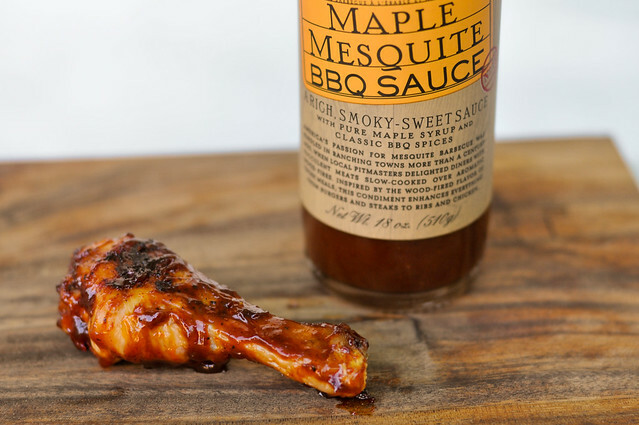 The strong mesquite masked most of the sweetness that was going on, making the maple portion of sauce almost indiscernible. The sauce started to shine after being cooked. The smokiness subsided a bit, allowing the sweetness to start striking a balance. Although I still wasn't quite getting a distinct maple flavor, the finished sauce definitely had all the stickiness associated with syrup and pleasing deep red color. 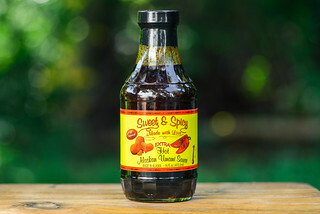 Seeing as the smokiness mellowed, sweet came out, and color was appealing after being cooked, this sauce is best used as a baste during cooking rather than a condiment. 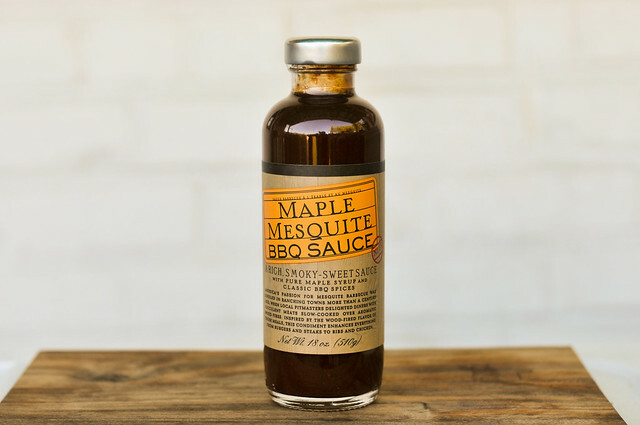 With a heavy mesquite flavor, I wouldn't recommend this sauce for use with anything already smoked, like ribs or pulled pork. 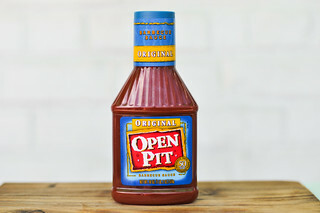 Instead, I think this makes a great finishing sauce for grilled items like chicken or pork chops. $12.95 for a bottle of ketchup? Some people have no shame what so ever. I thought my ketchup flavor competitors were bad at $7.00. Seriously, let me know if you want to try a true premium sauce that is almost half the price of the Williams-Sonoma and has NO ketchup!